Four months since my last post… Yikes. Since the winter solstice the world has gone without my financial advice. How did you ever survive? I’m not sure. These days it seems like political figures have a book titled “The Correct Answers To Every Question Ever”. They spend hours even days reading this book and afterwards have little round table discussions before ultimately deciding to do the exact opposite of what the book suggests. And that in a nut shell is what this post is about. Human incompetence and how to profit off it. These days politicians seem to gush over natural gas like 12 year old school girls do for Twilight. It’s become a mob mentality of sorts that any form of energy not derived from natural gas is evil. Obama hates coal. Merkel hates nuclear – by 2022 all of Germany’s nuclear power plants that provide the equivalent to their natural gas consumption will have been decommissioned. Both love natural gas. Ironically, Russia holds the largest reserves of natural gas in the world so you’d think politicians would love that country? Right? RIGHT?! Wait no they don’t. They hate those guys or at least America does. But I’ll get into that later. There are so many factors going for an increase in natural gas prices in the US and around the world it’s not even funny. Obama hates coal. Ever since the age of seven when he found a lump of coal in his stocking instead of the solar powered Hot Wheels he so desperately wanted, he has held a not so secret vendetta against the inanimate hydrocarbon. From 2010 through the end of 2014 he will have retired 30GW worth of coal fired power plants and by 2016 that number will rise to 40GW. The belief that coal power is more polluting than natural gas just took a serious hit with a recent paper out of Cornell and Purdue (http://www.pnas.org/content/early/2014/04/10/1316546111) states that methane emissions from drilling sites may be 100 to 1000 times greater than thought. 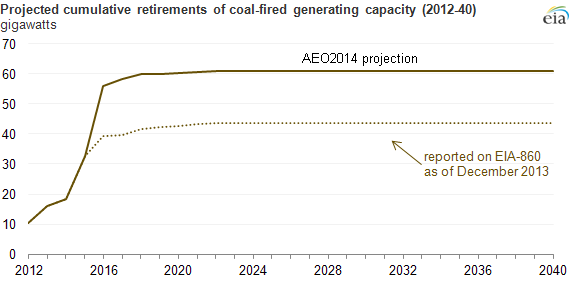 So it’s possible that we will be retiring these coal power plants for nothing. One question that remains is how are we going to pick up the slack from a lack of coal power plants? I personally run my car and house on unicorn and fairy dust but I’m told the technology isn’t quite ready for the big stage. So that leaves us with nuclear, wind, solar and natural gas to make up the difference. Nuclear power plants take years to build. Solar and wind doesn’t generate near enough power to meet our needs. Thus we are left with natural gas. 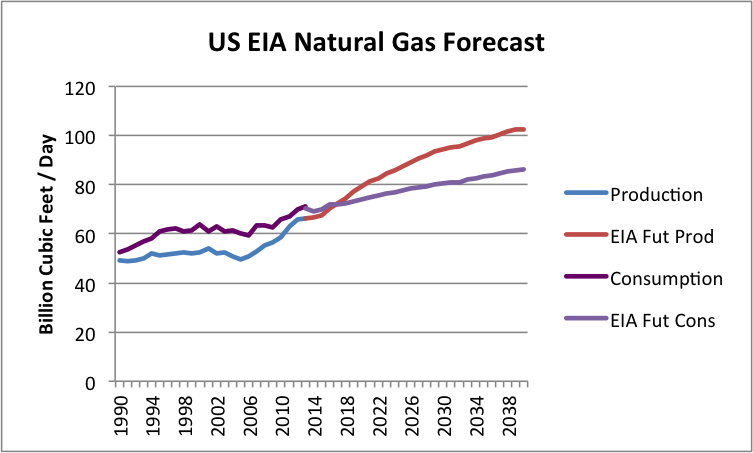 According to the chart above the US will remain a natural gas IMPORTER until at least 2016. Yes that’s right we don’t even extract enough natural gas to meet our own needs. Adding to the incompetence, the EIA doesn’t seem to think our consumption of natural gas will go up while we slay coal power plants like dragons. 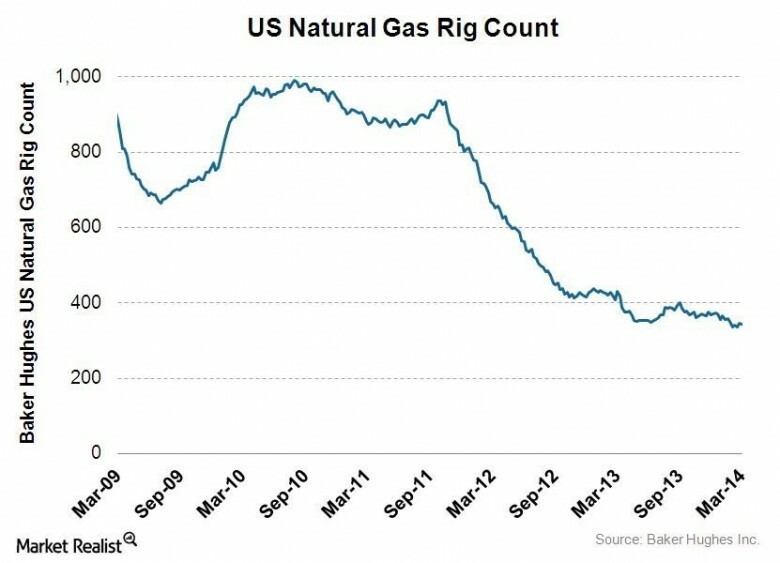 As you can see, the amount of natural gas rigs in the US has fallen 60% in the past 3 years. So the question is how are they going to increase production? In the short term, they aren’t. Thus as our demand for gas increases our supply will be left behind. The US and EU are playing a dangerous game with Russia in regards to The Ukraine. Currently, Russia provides the EU with HALF that’s right HALF of its fossil fuel imports. The percentages breakdown as 33% oil, 40% natural gas, and 25% coal of the EU’s imports. 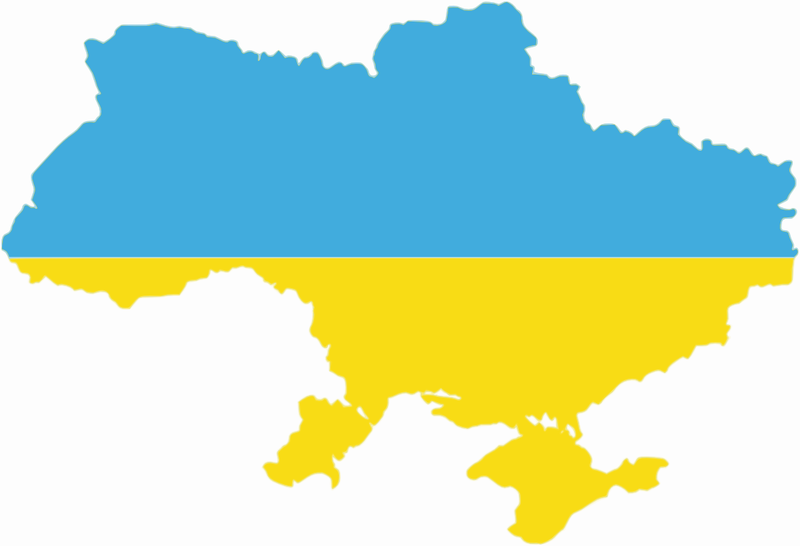 Now 16% of all natural gas consumed in Europe flows through The Ukraine. Thus what happens in The Ukraine has huge implications for natural gas all over the world. Russia is looking to sign a natural gas deal with China which would send billions of dollars worth of gas east instead of west. The deal is expected to be closed before Putin’s visit to China in May of this year. If that deal goes through Europe could see a lot less natural gas and force them to buy from elsewhere… Elsewhere… hmm… Oh yeah, America. That’s right, to meet help meet Europe’s natural gas demand and loosen Russia’s grip on Europe, we could see our natural gas shipped overseas. It will be interesting to see how this all plays out but at the very least, it looks like natural gas’ price is set to go up. That’s it for now. I’ll try and get another post up about the crash of housing bubble 2.0 in the next few weeks… Yeah and unicorn energy will power the world.